Drogon Rechen was born to a prosperous family in the Yarlung area of Tsang in southern Central Tibet. He gave rise to bodhicitta while only a child and, by the age of nine, he became a student of the Kagyu siddha Zangri Repa. He received many teachings from this lama, including the ear-whispered instructions and dohas of the Mahamudra masters. He practiced meditation wearing only a cotton cloth and experienced many signs of meditative accomplishment, which earned him the name Rechen, ‘great cotton-clad yogi’. Learning that Dusum Khyenpa was living at Kampo Nenang, Drogon Rechen set off to meet him. Dusum Khyenpa did not make it easy for Drogon Rechen, and put him though a few tests first. When they first met, Dusum Khyenpa told Drogon Rechen, “O young tantric practitioner, you can go and study with my students!” Drogon Rechen was sent to visit Baltsa Takdelwa. When he arrived at Takdelwa’s cave, he was terrified to find a huge tiger asleep where the yogi should have been sitting, and he ran back down the mountain. He was sent back up to look again and when he did, he saw a little pond in the cave. Again finding no Takdelwa, he tossed some pebbles in the pond and left. When he was told to go back for a third time, he found an old yogi sitting with those same pebbles in his lap. 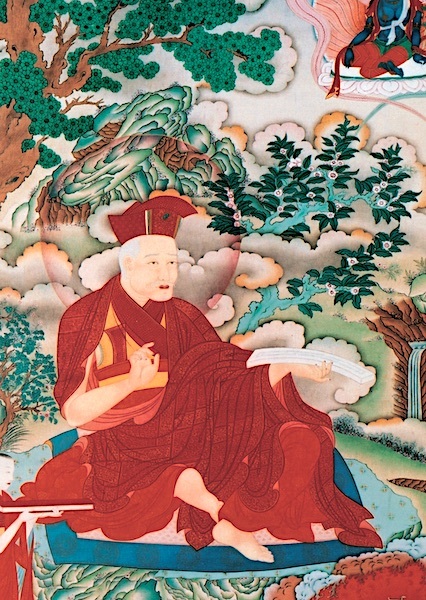 Realising that Takdelwa had been there all along, Drogon Rechen thought, “If his students are like this, then their Lama must be extraordinary.” Making a strong commitment, he practiced under the direction of Dusum Khyenpa’s students for seven years and completely stabilised his practice and realisation. Then Dusum Khyenpa himself bestowed upon him all the teachings, transmissions and empowerments that he had received, withholding nothing, like pouring milk into a pure crystal vase. Drogon Rechen also became a fully ordained monk at the age of thirty-seven and was given the name Sonam Dragpa. He continued to receive the full Kagyu transmission from Dusum Khyenpa for three more years, upon which he became the lineage holder. When Dusum Khyenpa travelled back to Central Tibet, Drogon Rechen stayed in Kham, carrying out the activities of his root guru at Karma Gön and Khampo Nyenang. At the age of seventy, Drogon Rechen passed into Parinirvana, leaving behind many relics after his cremation. His principal disciple and the Kagyu lineage holder was Pomdrakpa Sonam Dorje.